Mr. Foster can turn his house to suit the view or time of day. The structure at left, built square and immovable for contrast, is a garage and playroom. If Richard Foster decides he I would rather have the setting sun shine into his living room in winter but not in summer, the answer is simple. He just turns the house around. That isn’t such a job as it sounds. The New York architect—a former Pittsburgher — can simply press a button and the house will turn itself. Mr. Foster designed his home to turn in a complete circle in order to take full advantage of the landscape at Wilton, Conn., an hour’s drive from his New York City office. As easily as switching a television channel, he can change the view from a pond to a pine woods, a rolling hill-side, or the rooftop of a not-too-close neighbor. The rotating feature wasn’t his original plan for the house. It resulted from difficulties in fitting his ideas to the terrain and to building restrictions requiring it to be farther down the slope than it should be. He worked them out by building the steel, glass and cedar shingle house in the shape of a mushroom. The stem contains the front door, stairwell and rotating mechanism, not much larger than a shoe box, and run by a 11/2 horsepower motor. 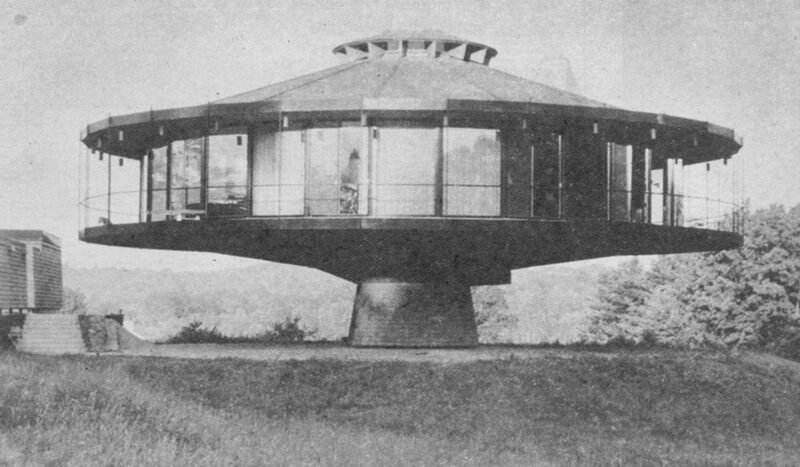 The circular house, 72 feet in diameter, cost something over $100,000, including $15,000 to $20,000 extra for the rotating features. Its half million pounds rest on a three-ton, 14-foot ball bearing, similar in design to those used on heavy cranes and battleship gun turrets. The bearing is strong enough to carry 10 times the required weight, and withstand the forces that would be created by winds of 125 miles an hour. The mechanism works much like an elevator, and its operating cost is about that of a refrigerator. The controls include three buttons, marked “forward,” “backward,” and “stop;” and a dial for controlling the speed, to allow for from five to 20 complete turns in 24 hours. Even at the highest speed, not much faster than the minute hand of a clock, the motion isn’t perceptible, except by watching the change of scenery. Mr. Foster never goes for rides in the house, but his three sons sometimes do, to amaze their friends. Craig, 22, is in medical school; Robert, 20, at Alliance College, and Bradley, 16, in high school. Mr. Foster was born in the Fine-view section of Pittsburgh, attended Perry High School, and left what is now Carnegie-Mellon University to enlist in the Army in World War II. Leaving service with the rank of captain, he entered Pratt Institute, graduating as a bachelor of architecture and with an award for excellence in the field, in 1950. He was coordinating architect with Mies van der Rohe and Philip John-son on the Seagram Building in New York, and was Mr. Johnson’s partner on over 50 projects, including New York’s Lincoln Center and its World’s Fair pavilion, many university and business structures, and an atomic reactor in Israel. Since establishing his own firm four years ago he has completed office buildings and other structures, and is now engaged on such projects as the Golf and Racquet Club at Montauk, L. I.; a synagog and school in Brooklyn, and a rehabilitation center at Rockland (N. Y.) State Hospital. In 1967 he was honored by Pratt as Alumnus of the Year. His revolutionary home can be turned round and round as many times as desired without stopping. It is supplied with telephone and electric services by slip-ring devices, and with water and fuel through 360-degree valves of the kind used in the oil industry. Sewage is removed through a giant, ring-shaped water trap of his own devising.